A world renowned doyen of Hindustani classical music, the late Kishori Amonkar transcended many boundaries to create space for herself in the world largely dominated by men. Not only did she challenge the conventions of ‘gharana’ system but also emerge as a no-nonsense musician who made sure that she received acknowledgement wherever it was due. She was the recipient of the prestigious Padma Bhushan and Padma Vibhushan for reshaping the contours of Hindustani Music and popularising it at the global level. 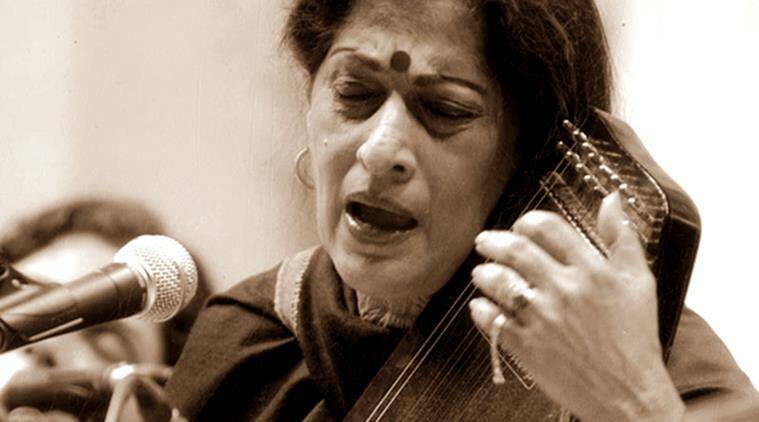 Born in 1932 in a Maharashtrian household, Kishori Amonkar received her initial training from her mother Mogubai Kurdikar, who hailed from the Jaipur-Atrauli gharana. Subsequently she developed her unique style of music which had shades of various other gharanas including – Gwalior, Agra and Bhendi Bazaar. Apart from establishing herself as one of the stalwarts of traditional Khyaal Music, she popularised light classical forms and also lend her voice to Bollywood. Her rendition of the famous composition in Raag Bhairavi – Babul Mora Naihar Chhuto hi Jaaye (Dear Father! Thus I leave my motherland), penned by Nawab Wajid Ali Shah, continues to evoke solace and divinity in equal proportion. She also trained with Pt Husanlal from the Bombay film industry in order to imbibe the nuances of playback singing. Her title song for Geet Gaya Pathharon Ne (The Rocks Sang A Melody) made her popular and she later composed and sang for Govind Nihalani’s Drishti. Her attention to detailing, emotion, literature and divinity gave her an edge over her contemporaries. However, her style of intermeshing different styles and forms of music and deforming the conventional format also invited huge criticism from the musicians during that time. She strongly felt that gharanas must not limit an artist to certain boundaries and one should constantly bring new interpretations to compositions in order to bring variety in the rendition. But it was believed to be blasphemous to challenge the traditional structures. “People called me a rebel. I don’t think I am one. I am a vehement person and I speak the truth. When you are sublime, the abstract begins to acquire a form. Then what the critics said did not matter. It still does not matter”, said Amonkar. She was her biggest critic and would play tapes of her recordings all day in order to correct herself. Despite the criticism, she remained true to her own style and successfully established herself as an immortal artist who remains to be an inspiration to many. Apart from redefining the traditional methods of singing and presentation styles, she was also one of the first female musicians who demanded the title of ‘Vidushi’ for all the successful female classical vocalists. All the male artists are addressed as either Ustad or Pandit but there was no such title for female musicians. Her fierceness to speak up for the recognition of the female musicians emanated from her childhood experiences. She had seen her mother struggle to gain respect from her male contemporaries. Her mother, Mogubai Kurdikar, was born in the Kalavant caste of Goa, which is today listed in the OBC category. The kalavants were lower caste groups who were supposed to provide ‘services’ to temple. Mogubai was forced to eat separately and was subjected to the violent upper caste male gaze, not just because she was a woman but because she belonged to a lower caste group. It is interesting that we rarely find Kishori Amonkar described as a part of the lower caste group which her mother was a part. In all her eulogies, we hardly find the mention of her caste, which hints at the practice of historical erasure. Not a single newspaper report or interview mentions her caste and according to Rohan Arthur (in his paper on ‘Kishori Amonkar: Assertion, Erasure and Reclamation’), this was one of the Brahmanical tactics of usurping the valuable contributions made by lower caste groups to keep the dominance of Brahmanism intact. Having seen her mother’s treacherous journey and struggle to carve her own path against all odds, Kishori Amonkar made sure that she stood up for herself even if at the cost of being maligned. She would never compromise on receiving recognition and getting her due acknowledgement. “I always stay in a proper hotel suite, I make sure that I am provided with a car, which is available at all times, and that all the payments are made properly”, she said in an interview with Indian Express. Her uncompromising fierceness is also reflected in her pre-performance tantrums that became her signature. She was never afraid to express her disagreements, even if the chief guest was a prominent personality. She strongly felt that music was not for people’s entertainment but a means for her dialogue with the divine. She never sang to attract the audience and therefore did not tolerate their interruptions and she never played to the gallery. There were also instances where she refused to a go to an international concert because she didn’t feel comfortable with the surroundings. Her unperturbed focus on her music was also reflected in her simple attire and unembellished stage. She didn’t like bright light falling straight on her face and always chose to dress up soberly. Kishori Amonkar took her last breath at the age of 84 on April 4th, 2017 after a brief illness. Her bold stance and unabashed opinions about everything around her made her not just a rebellious musician who challenged the traditional methods of performative arts but also a fierce feminist who never bowed down to the unruly system customised for male artists. She created a name for herself and continues to inspire many artists across age, genre, and region. Her contributions shall be remembered forever. Tanya is a post-graduate in Media Studies from Centre for Culture, Media and Governance at Jamia Milia Islamia. She is passionate about music, cinema and lots of street food. Serena Williams Vs Carlos Ramos: Why Are Emotions So Gendered?